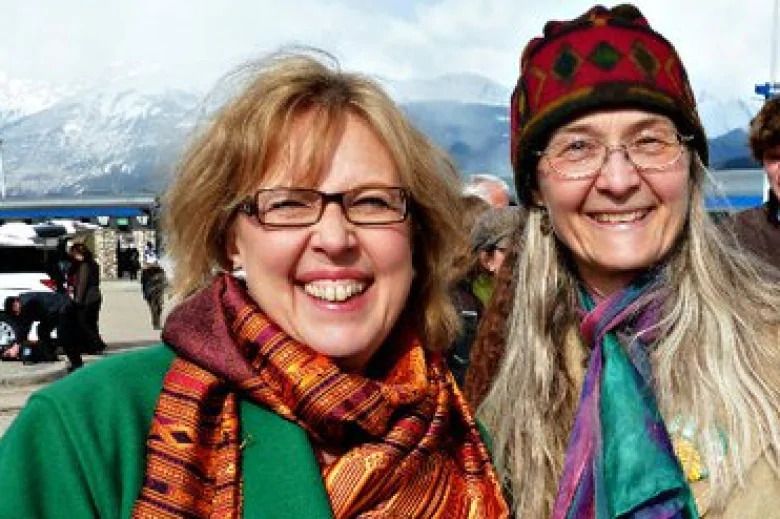 Monika Schaefer (on the right), the perfect Green Party candidate and poster child, is on trial in a post-National Socialist People’s Court for throughtcrime. This highly-redacted video was her undoing. Germany has no free speech guarantees, and concepts like initiation of force and individual rights are evidently as baffling there as in 1933. The charge is “Volksverhetzung,” an ungoodthinkful sort of incitement to hatred. Volksverhetzung is the perfect vehicle for selective political persecution. It’s even money that before the year is out indictments will be true-billed for wondering aloud why there is no ozone hole at the North Pole, in the hemisphere where 8/9 of humanity live. Indeed, to question whether eco-Gestapo-ordered replacements for regular freon cause air conditioners to fail–making folks feel like climate is getting warmer–ought to be good for at least a 5-year prison term. 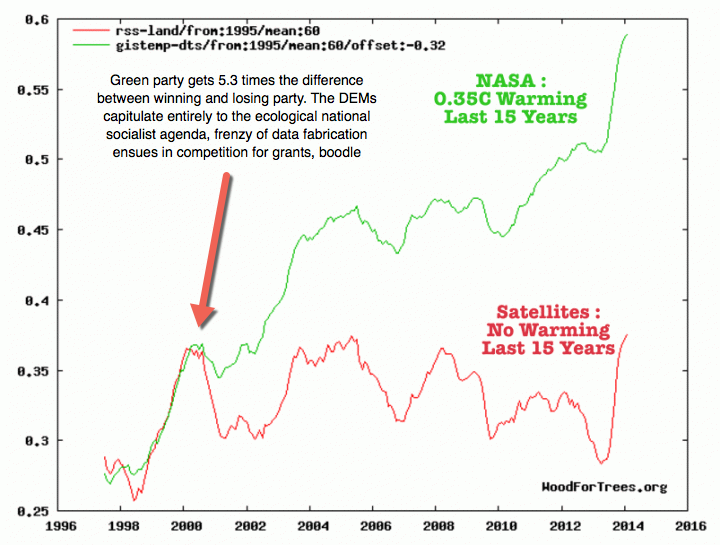 Circulating graphs of tampered-with ground thermometer measurements compared with satellite data ought to be good for a prison terms plus some asset forfeiture and heavy fines. The German penchant for forced labor instead of Buckminster Fuller “energy slaves” has already led new-left and econazi politicos to legislate the shutdown of demonically-possessed nuclear power plants that generate no carbon dioxide but (gasp!) increase the supply of electrical power. The prewar English translation of “Mein Kampf” recommended “extirpation” of all things Jewish in the name of altruist collectivism. Postwar editions changed the operative term to “extermination.” Surely there is a clue about Holocaust eugenics to be had in the published works of politicians elected to office and preferred by those huge Christian majorities in Germany and Austria. If ever in need of technical translations from Spanish, Portuguese or English involving mining or nuclear energy, look me up. Need a translator able to read a thermometer? This is Rudy’s presentation. Rudy’s baccalaureate was in Geology, followed by an MS in Electrical Engineering. He is a programmer, chip designer and detector of pseudoscientific flim-flammery much like Prof. Petr Beckmann. Here he is in the Southern Hemisphere Land of Auz, in the half of Planet Earth that is home to only 1/9 of humanity.